Homeostasis, in general, is any internal biochemical system that regulates the body’s internal environment, with a view to maintaining properties such as temperature, acidity, etc, in a stable and relatively constant condition. Sleep-wake homeostasis, in particular, can be thought of as a kind of internal timer or counter that generates a homeostatic sleep drive or pressure for sleep as a function of the amount of time elapsed since the last adequate sleep episode. It is quite intuitive in its operation: the longer we have been awake, the stronger the desire and need to sleep becomes, and the greater the likelihood of falling asleep; the longer we have been asleep, the more the pressure to sleep dissipates, and the greater the likelihood of awakening. Compared to the circadian drive for arousal, the actual mechanism of sleep-wake homeostasis is relatively poorly understood, despite years of research. But what we do know is that an endogenous (i.e. naturally produced by the body itself) sleep-regulating substance, or substances, builds up in the body’s cerebrospinal fluid during our waking hours, which has the effect of increasing the pressure to sleep the more it accumulates. This pressure is only released by the act of sleeping itself, during which the levels of the sleep-regulating substance in the body rapidly declines. The best known of these sleep-regulating substances (although probably not the only one) is adenosine. 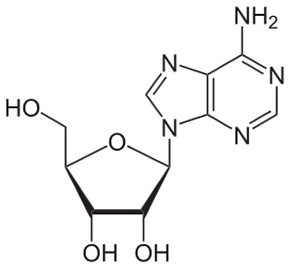 Adenosine operates as a neuromodulator in the brain, and has the effect of inhibiting many of the bodily processes associated with wakefulness, particularly those involving the neurotransmitters norepinephrine, acetylcholine and serotonin. 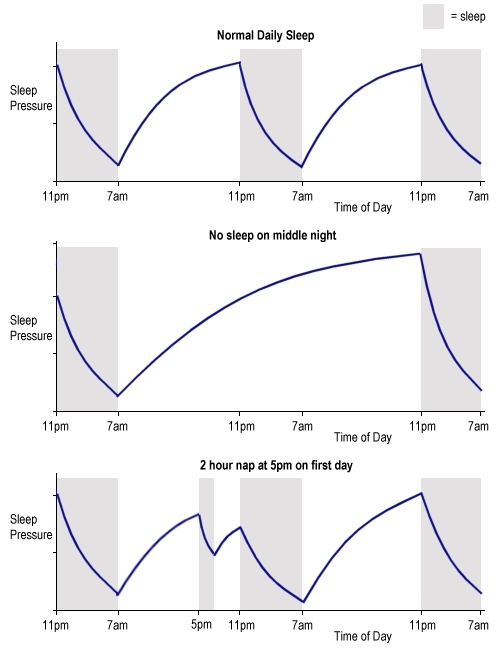 Adenosine levels in the basal forebrain rise as sleep debt builds up, and then fall rapidly during the subsequent sleep period. Adenosine is created over the course of the day, as a natural by-product of using up our internal energy stores (it forms the core of adenosine triphosphate (ATP), the energy-storage molecule that powers most of the biochemical reactions inside cells). This supports the theory that the body’s regular desire for sleep stems, at least in part, from the brain’s periodic need to replenish low stores of energy: in 1995, Craig Heller and Joel Benington proposed this theory, based on the observation that, as the brain’s glycogen energy stores are depleted throughout the day, extra-cellular adenosine builds up, and then, during sleep, the adenosine is removed and replaced by new glycogen. Experiments have definitively shown that high levels of adenosine lead to sleepiness. Studies in animals have shown that blocking adenosine‘s actions in the brain increases alertness, while injections of adenosine or similar compounds induce apparently normal sleep. Also, adenosine concentrations in the brain shoot up dramatically in animals forced to stay awake. Commonly used stimulants, like the caffeine in coffee, tea, cola and energy drinks (as well as the theophylline in tea and chocolate), work as adenosine antagonists or receptor blockers, inhibiting or dampening its sleepiness effect, and thereby maintaining alertness. The main sleep-wake homeostatic mechanism appears to refer specifically to non-REM sleep, and particularly deep or slow-wave sleep. Thus, in general, the pressure to sleep is a pressure to enter into deep non-REM sleep, a pressure that is only relieved by a period of actual deep non-REM sleep. It is still not entirely clear whether there is a similar mechanism for REM sleep, although the indications are that there may well be. So, the loss of REM sleep also leads to an increase in the tendency to enter REM sleep (also known as rebound sleep), but, unlike the case with slow-wave sleep, this loss appears to be compensated up to a certain extent only, and with certain differences between different animals. On awakening in the morning, a phenonemenon known as sleep inertia sometimes takes hold, which manifests itself as a general feeling of grogginess and impaired motor activity which may last for up to half-an-hour after waking, and which may be accompanied by a distinct feeling of wanting to return to sleep, even at times appropriate for normal waking. This is most likely to occur when waking from deep slow-wave sleep rather than from light sleep or REM sleep, and may be more severe (and last longer) after waking from a sleep period or nap following a prolonged period of wakefulness or accumulated sleep debt. 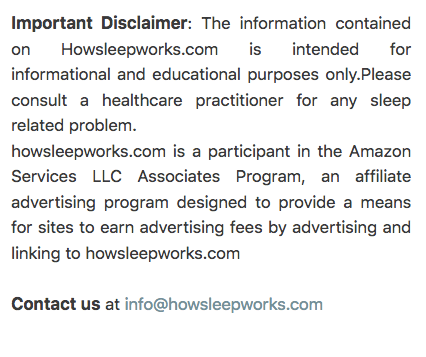 It may be caused by an excessive build-up of adenosine (through the normal sleep-wake homeostasis process) that has not fully dissipated by the time of awakening. Interestingly, to some extent, light exposure seems to directly affect alertness, performance and mood through the sleep-wake homeostatic process, in addition to its essential part in regulating the circadian clock.